If you follow me on instagram (here) you have probably seen this outfit pop up one too many times. This combo has been one of my go to’s this summer as there is something so fresh about orange and white! This skirt was one of my best purchases this summer as I have worn it too many times to count. The sweet scallops make it perfect for summer and the fact that it goes with just about anything makes it a closet staple. Pairing it with orange and turquoise was an absolute no brainer as this color combo screams bohemian summertime! This week’s blogger of the week from last week’s link-up is Katey of Two Peas in a Blog! I love Katey’s fresh summer look, pairing neon with white! I also appreciates that she gives some helpful tips for wearing neon colors…something I always need a hand with! Fun fact? Two Peas in a Blog is actually run by two identical twin sisters…Katey and Betsy (hence the name)! I can’t wait to see more by these two gorgeous sisters! Love this ensemble from top to toe! Very cute outfit, love the necklace. I LOVE this outfit! That scalloped skirt is adorable. The combination of orange and turquoise is gorgeous. I've been looking for a pair of gladiator sandals. Yours are perfect. I like how they only go up to your ankle. 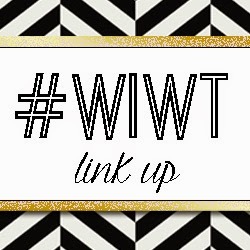 We just started a Fashion Link-up on Tuesdays! We'd love for you to link-up. Very nice ensemble, look great on you!